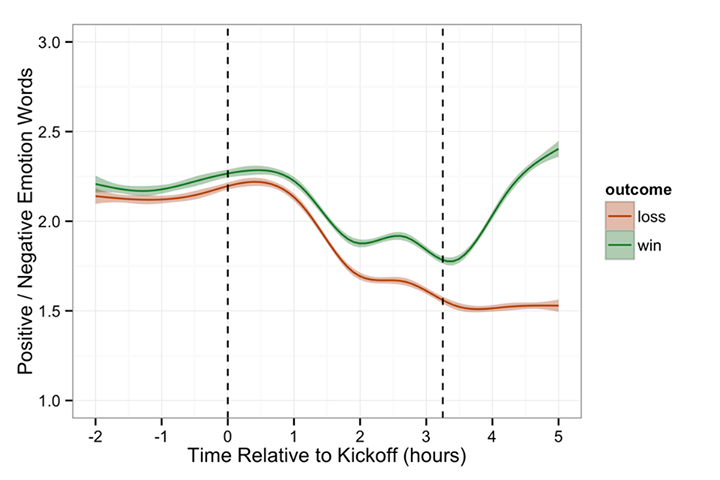 The data science team at Facebook has analyzed users’ posts about National Football League teams over the course of the season and has shared the results in a blog post. 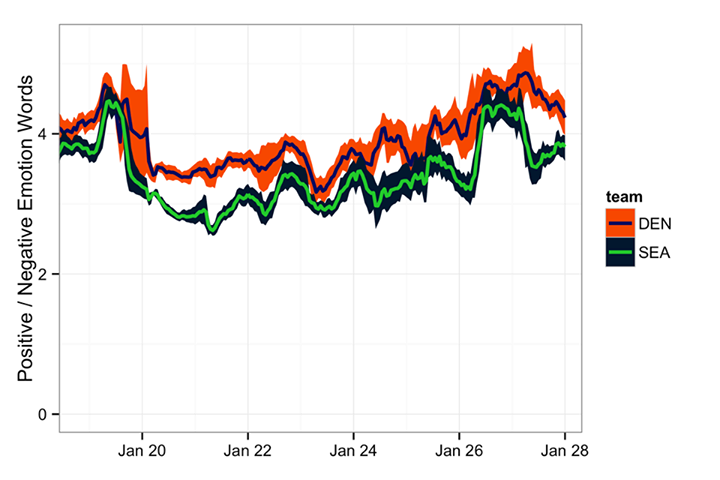 They show some interesting trends in the fluctuations of fans’ sentiments before, during and after games, and — if the overall pattern is any indicator — might point to a Denver Broncos victory in Sunday’s Super Bowl. I tend to think Facebook might be a better gauge of sentiment for topics like sports, if only because its user base is so much larger and more engaged, and users — from all I’ve heard — engage in more personal discussions on Facebook than on places like Twitter. You can see in this chart how, over the course of a season, fans of teams that won their games tend to use more positive language about their teams leading up to the games (and definitely during and after them). But the really interesting part of this experiment is the timing — because, of course, the Super Bowl is being played on Sunday between the Denver Broncos and the Seattle Seahawks. If Floyd Mayweather’s reported $10.4 million bet on Denver wasn’t enough to convince you it will win, maybe this graph of Facebook-user sentiment will. Vegas has Denver, Facebook has Denver. Now seems like as a good a time as any for bandwagon-jumpers to go grab a Peyton Manning jersey.